This is a three-week course with classes held every day (except weekends) at the Faculty of Philosophy, Centre for Serbian as a Foreign Language, Novi Sad, Dr Zorana Djindjica 2. There are 5 language practice classes a day (one class lasts 45 minutes). The participants are divided into small groups (of up to 8 students) in order to ensure active involvement of each participant. High-quality instruction of Serbian combined with small groups guarantees good results. Advanced – 1 and 2 (levels C1 and C2). The participants can choose lectures on specific areas in the first week (at the placement exam) and these will be organized if a sufficient number of participants apply for them (at least five for one area). 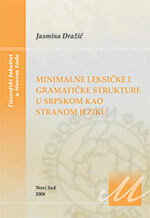 All lectures and workshops, are in Serbian. The three-week programme consists of 75 language practice classes, which corresponds (both by the syllabus and the scope) to a one-semester course and brings 5 credits (ECTS). At the end of the course, there is assessment of the participants’ achievement (in written and oral examinations). Each participant who fulfils all course requirements and passes the final examination will be issued with a Certificate of Proficiency in Serbian. The achievement at the examination is graded in accordance with the university practice in Serbia (from grade 6, the lowest pass, to grade 10, the highest). The examination earns the students 5 credits (ECTS), which they can transfer to their home universities. 2. Milivoj Alanović, et al. (2006). 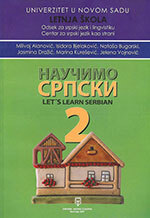 Naučimo srpski – Let’s Learn Serbian 2. Novi Sad: Filozofski fakultet – Dnevnik (the set includes a course book, a workbook and two audio CDs with listening exercises). The price of the set is included in the course fee. These course books have been designed for students of elementary and intermediate levels of proficiency (A1, A2, B1 and B2). For advanced students of levels 1 and 2 (C1 and C2), there are special problem-oriented texts and tailor-made exercises and workshops, which develop the students’ grammatical, lexico-semantic and communicative competence. Dražić, Jasmina (2008). 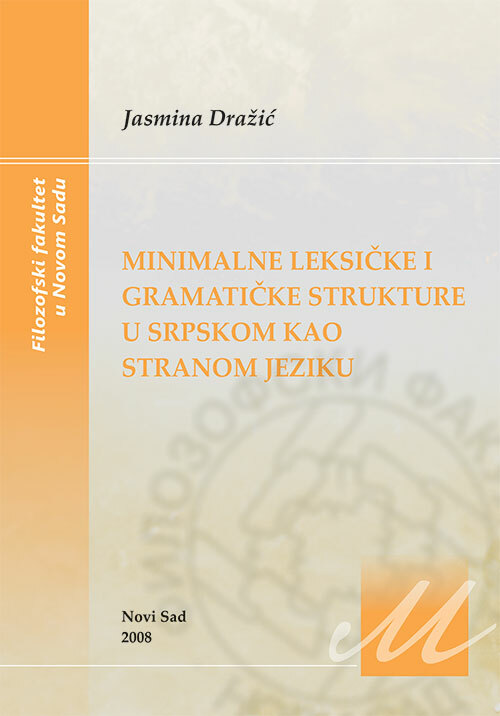 Minimalne leksičke i gramatičke strukture u srpskom kao stranom jeziku. Novi Sad: Filozofski fakultet. Babić, Biljana (2011). Naučimo srpski 1 i 2 - Rečnik glagola. Novi Sad: Filozofski fakultet. 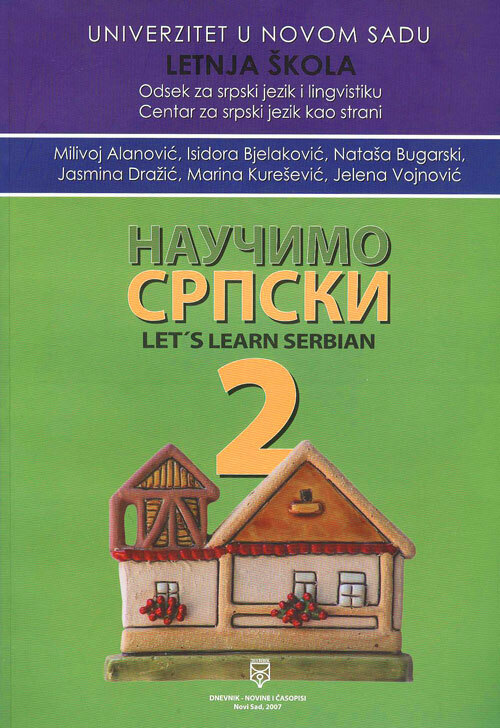 Naučimo srpski 1 i 2 – Rečnik glagola – for students learning Serbian as a foreign language or as a second language; designed with the aim to facilitate learning and acquisition of verbs. 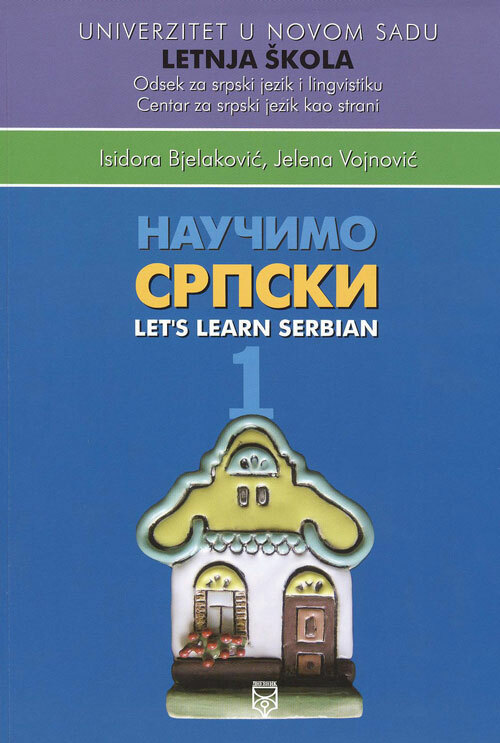 The Dictionary is published as a complement of the set Let's Learn Serbian 1 and Let's learn Serbian 2 (Naučimo srpski 1 and Naučimo srpski 2). The Dictionary contains all the verb forms from the set (course book, workbook and audio CDs), except for the verbs found in the student instructions. In addition, the Dictionary has instructions for its use (Guide to the Dictionary) and tables with keys for symbols and abbreviations in 5 languages: Serbian, English, German, Russian and Korean.